Yeah, in this topic, I'm taking sprite requests and making them into reality FOR FREE! 1.You can't request a gigantic cyberdemon replacement with rotations, firing frames, walking, stuff like that. 3. You can't request super big pixel art. I will enlarge the art if it is too small, but it cannot be a massive 200x300 giant detailed painting. 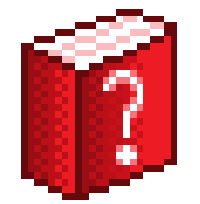 OK, here's an example, a book I made with a question mark on it. Although if you want, I can make the sprite of it and you can make all the rotations, firing frames, stuff like that.